"I don't want yummy cookies for breakfast," said no one ever. 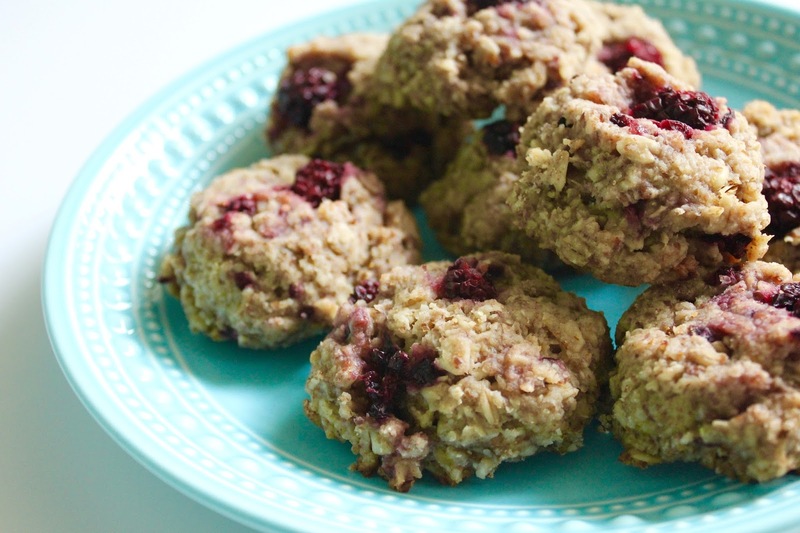 It is safe to say that I'm OBSESSED with this recipe/these breakfast cookies. For someone who is always rushed in the mornings, these are perfect for on-the-go gals like myself. Truthfully, I eat these at any point in the day, not just for breakfast! Within the last month, I've probably made six batches of these bad boys..... Not kidding they're addictive. Preheat oven to 350 degrees then line a baking sheet with parchment paper and set aside. Add 1-3/4 cups oats to a food processor (I use my Nutri Ninja!) then process until very fine to make an oat flour. Add oat flour, remaining 2 cups oats, baking soda, salt, & flaxseed into a large bowl and mix together. Add applesauce, banana, honey, coconut oil, lemon zest, and lemon juice then mix. Fold in blackberries, then let batter sit for 8-10 minutes to thicken. Scoop batter - I used an ice cream scoop - onto prepared baking sheet and press down to flatten slightly (the cookies won't spread in the oven). Bake for 8-10 minutes, or until cookies are golden brown. Cool completely then store in an airtight container for up to 2 days or in your fridge for up to 4 days. Here's to the perfect quick breakfast! Insider tip: I like to make a full batch of these on Sunday evenings so that I have them for the week! But, they're usually all gone by Tuesday.... whooops. Can't believe the weekend went by so fast! Hope you've all had a great start to the week! oh-my-gosh... these look fabulous! I am so pinning this so that I can have yummy cookies for breakfast!! They're so addictive!! ;) Thanks for sharing! Absolutely! Finally a cookie we don't have to feel too guilty about :) Thanks for reading! Ahh they're quite scrumptious! Thanks so much for reading! These look so good and my stomach wont stop growling!!! Mine would be gone by tonight! It takes some serious self-control for me to not eat them all in one sitting! Thanks for reading!! These look so good!! Are you vegan? Baking (and cooking in general) can be so tough without using eggs. Awesome recipe! Yum! 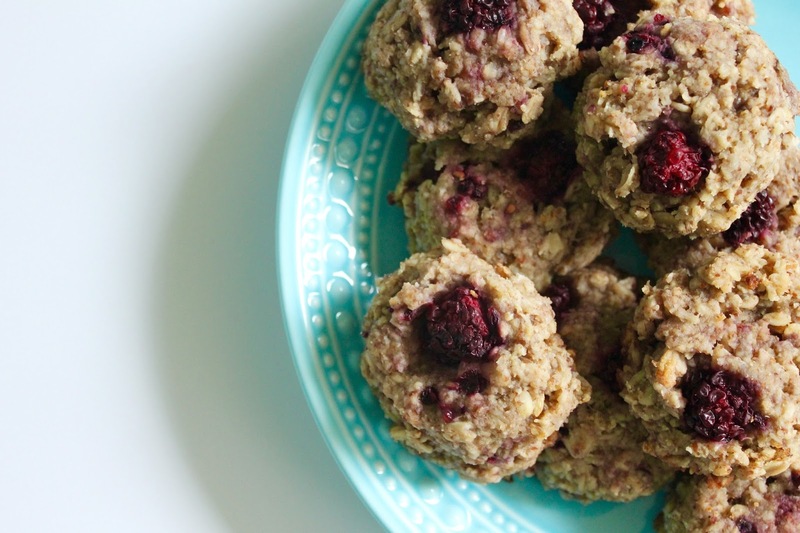 These sound fab--plus who doesn't want to have cookies for breakfast?! That's what I'm saying! :) Thanks so much for reading!! I need to make these!!! I am lactose intolerant, though I still eat dairy, but I need to start limiting my dairy and I need something good for breakfast so these are PERFECT!!! Sounds like these would be perfect for you, Brooke!! I'm sure you will love them too! yum!! these look so good. I just made a batch of oatmeal chocolate chip cookies, so I am going to have to try these!! YUM! I have a new appreciation for any form of oatmeal cookies now, and I've got a love for dark chocolate! I haven't eaten breakfast yet and I am STARVING hahahhaa I may have to make these for later this week! I used to skip breakfast a lot from being in a rush!! I think you'll love these! These look amazing! I am starting to cut gluten out of my diet and then dairy and these look amazing! I am definitely going to be making these soon! They taste so good, you'll completely forget they're healthy!! Let me know how it goes, and hope you enjoy them!! Yum these sound great! Once they're made, what an easy grab and go for breakfast! Absolutely, Darcy! Makes things easier for us on-the-go gals! Yum!! These sounds amazing! Definitely pinning these! Thanks for sharing, Sarah!! Hope you enjoy them! Holy smokes these look so good! I'm a big fan of preparing your breakfasts ahead of time, so these look awesome! Definitely, Victoria! I'm known for being in a rush, so these make life even easier! I even throw a few into a ziploc to take with me to work on wherever! Oh my gosh these look so good!! And so healthy!! I'm sure you'll love them as much as I do! Healthy cookies never tasted so good! I'm always wanting something sweet and quick for breakfast, so this is perfect! Thanks for sharing the recipe! Thanks for reading, Amanda! I hope you enjoy them!! Yuuuum I'm really bad about not eating breakfast (I know, I know!) so something like this would be perfect for me! These look DELISH! I used to be the same way,Valery! These makes things so much easier! Plus, if I'm in a super rush, it's easy to throw a few in a ziploc and head out the door! YUM!!! I need to make these stat! Thanks for sharing! Thanks for reading!! Hope you enjoy! Cookies for breakfast?! Yep, I'm in. These sound SO delicious. That's what I'm saying, Jessica! :) Thanks for reading, and love your new blog!! Thanks so much, McKenna!! Hope you have a fabulous evening! Oh yum, these look and sound delicious, not to mention super healthy! And cookies for breakfast...why YES PLEASE! Who doesn't love cookies for breakfast? Feeling bad while eating good haha These look fab! nom nom nom--these look great! Y U M !!! I am so excited to make these!! Always looking for sinless goodies :) Thanks for sharing!